I was absent from my blog.Was there homework? Is there a new assignment? I took a hiatus from writing and posting, chasing articles and images, I just took a break. I believe in the power of my blog to reach people and to get information I feel relevant, collected and redistributed. A little bit of my family newspaper heritage showing there. On the other hand, I have two day jobs and was in pursuit of several major projects. I took a good look at myself and my expectations and decided, I needed a break. One of my projects is the stories of Great Uncle George. George Henry Story to be exact, the man who painted Lincoln. I have been reading and researching his journals and accounts and parallel history to compile a vision of his life and work. A very important moment of that lifetime was when he sat with President Abraham Lincoln for three days sketching and taking notes prior to painting the portrait that now hangs in President Obama’s office. Here is what I have produced since the hiatus began. A one hour performance of stories from Uncle George Henry Story’s autobiography. ( unpublished but (c) ) My mother was working on publishing that before she passed away last year, that is something my brother and I plan to finish. Then there was the video project. The Wood Memorial Library and Gallery in So. 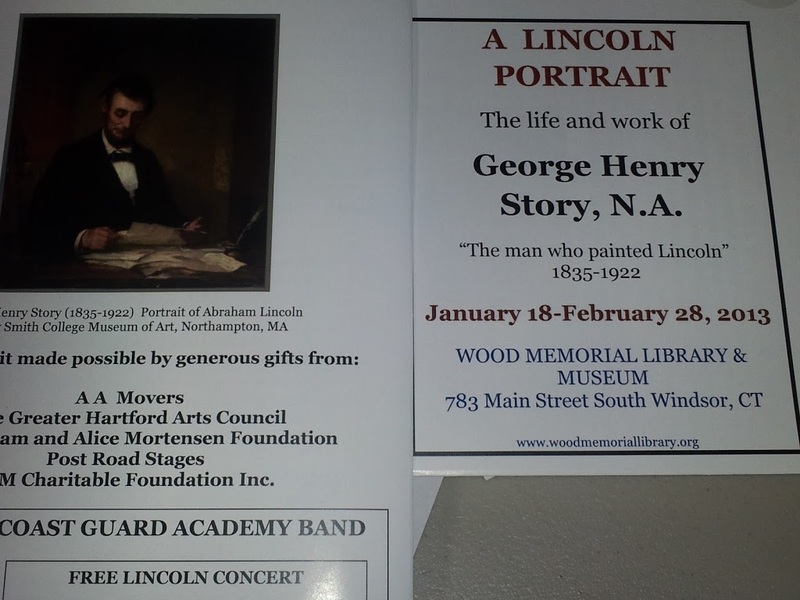 Windsor CT. www.woodmemoriallibrary.org was prepping an exhibit of paintings by George Story. The Wood worked in collaboration with The Wadsworth Athaneum, The Metropolitan Museum of Art NYC, The Brooklyn Museum and the Smith College Gallery along with private art collectors. The Metropolitan video team offered to make a orientation film. It was then that the Wood learned I was a professional storyteller and was performing pieces of Uncle George’s stories. 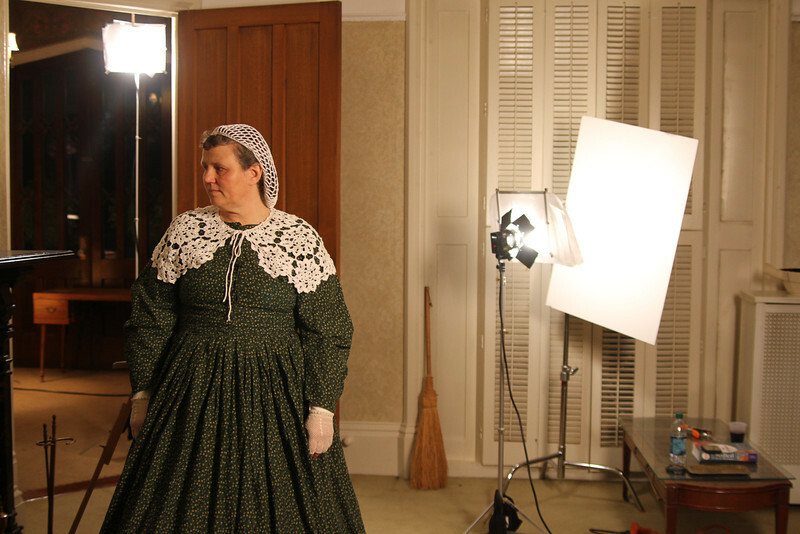 A magical evening under the lights, wired for sound, standing in a period home with appropriate props, we filmed the Lincoln story now showing at the Wood Memorial through Feb. 28, 2013. So venture out to the Wood Memorial Library and Gallery check the website for hours they are open and the special events dates. www.woodmemoriallibrary.org Take a long slow walk through the gallery and think about Uncle George sitting before his canvas, palette in hand, stroke by stroke capturing time. I’m back to posting blogs now, a little at a time, word by word, capturing time. Thanks for stopping by to read. Is that all Carolyn? And I thought you were busy. 🙂 Honestly, I am out of breath reading about the amazing work you have accomplished in such a short space of time. Thank you for elevating the art of storytelling! Bravo to you my friend. Thanks Karen, the video was by far the most fun thing I’ve done with my storytelling, it was a magical night. The house we used, a National Historical site was amazing the former home of Commodore Green, what a great B&B it would make!For Sale too! (Dzen Realty) The people were awesome, crew and the hand picked little audience. I was beaming all the way home, know how pleased my Mom and Grandma would have been and Great Uncle George! Then there was the gallery opening night WHEW what a ride!! Brian, It will be on CD Baby first and I will let you know when and how we can swap. I went to yhour site and read what you have been doing. We walk similar circles rooted in 1860’s! Hope we can meet up at some conference or festival and find a few minutes to talk about our work.